Yesterday marked a big moment for CQUniversity’s future – and for the future generations of Northern Queenslanders. I was thrilled to attend the opening of CQUniversity Townsville last night, and to see so many local business, education, and community leaders be wowed by this incredible $3 million project. At the event, there was a palpable sense - CQUniversity Townsville isn’t just a place to kickstart careers, but hub for the region’s growing community aspirations, too. Townsville is now a two-university city, and the new campus provides exciting opportunities for local students. Our expansion into Townsville demonstrates our national reputation for supporting our students to achieve, no matter how they choose to study. Many of our regional students, and also our international students, tell us they want to study in regional centres, and we believe Townsville can deliver them a great experience for study, and for lifestyle. It’s this experience, and our determination to engage all our students, that puts CQUniversity on track to becoming a truly great university. The campus is already supporting more than 600 Distance Education students, and I can see great potential for allowing growth, in face-to-face programs including Paramedic Science, Nursing, Law, Education, and Psychology. With multiple universities calling Townsville home, the Northern Queensland hub joins the ranks of Australian capital cities, and vibrant regional centres such the Gold Coast, Geelong, and Mackay. The CQUni Townsville campus includes large teaching spaces for class and residential schools, computer and videoconferencing labs, a Paramedic Science lab, a library, staff offices, study spaces and a welcoming reception area. It also boasts plenty of student parking, and room for further expansion along with this CQUniversity’s popular Study Hub at Jones St, which opened last year, will remain as a study space for students, with secure access available around the clock. The Townsville campus is one of 24 CQUniversity sites around Australia, and is a key to our plan to grow student numbers to 50,000 nationwide by 2020. The campus will not only support face-to-face learning, but students can also access a range of expanded services, including careers advice, counselling, and scholarship support. As I continue to serve on the panel advising the Prime Minister on the development of Northern Australia, the potential and growth opportunities of Townsville, and all of Northern Australia, continue to amaze me. Same goes for the enthusiasm of local people. Since we first established a presence in Townsville in August last year, I’ve been thrilled with the excitement of local leaders, businesses, and students who have welcomed us to Townsville. Yesterday, it was great to catch up with many of them, and hear how CQUniversity is already making a difference in their lives. Whether it’s helping locals to reach their dream careers, or attracting new students to Townsville, or even inspiring school leavers to pursue higher education that they might not of previously considered, I’m confident that this campus can deliver real social and economic benefits for the Townsville region. CQUniversity welcomes students and staff from all over the world. The rich infusion of different cultures and ideas is what makes ours such a vibrant and diverse university. And there are few countries, if any at all, that have the strength of ties with CQUniversity as Nepal. We count among our colleagues a number of staff originally from Nepal, including academics, researchers and professional staff. We have many business and philanthropic ties with Nepal as well, which sees us partner with a number of universities and hospitals/health clinics to provide research opportunities and unique student experiences. And we also host almost 700 Nepalese students at our Melbourne, Sydney, Brisbane, Bundaberg and Rockhampton campuses. Which is why it has been so heartbreaking to see the news reports of the 7.8-magnitude earthquake which devastated Nepal over the weekend. Oxfam are reporting that the current 2,500 death toll is ‘just the beginning’ of this unfolding catastrophe. Thousands more have been injured and countless scores have been left without shelter and other necessities. Information is currently being circulated to our hundreds of Nepalese students about what support and assistance CQUniversity can provide in exceptional circumstances such as this. For our Nepalese staff, the University can assist with a range of support, leave and counselling measures. CQUniversity’ s immediate response to this tragedy will be the provision of $10,000 worth of emergency shelter. 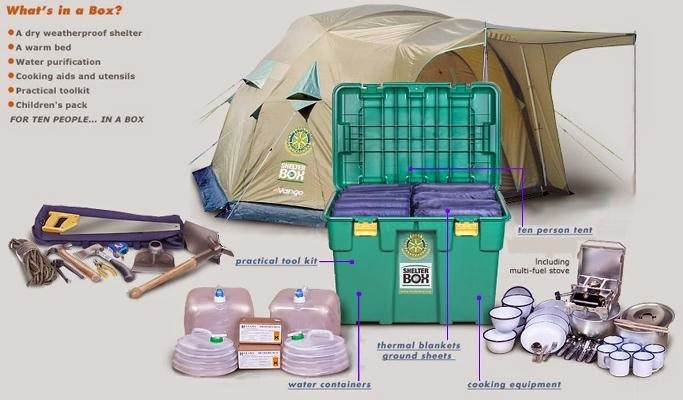 This will be via the Rotary Club who have developed Rotary Shelter Boxes; self-contained temporary housing and disaster survival kits that will be sent to the worst-struck areas of Nepal, containing enough emergency shelter, food, first aid, health/hygiene disease prevention and water purification facilities to cater for large family groups. CQUniversity’s donation will provide 10 Shelter boxes for 100 people. Below is an overview of the contents of each Rotary Shelter Box. There is still an enormous demand for more assistance. Can I encourage all staff and students to consider making a contribution towards additional Rotary Shelter Boxes. This is an extremely innovative, practical and rapid way of getting real help to those in desperate need. Donations can be made via direct deposit to the Rotary Sunrise Club BSB 034 210 Account Number 148076. Please add ‘UniNepal’ as your transaction reference. For a receipt please email a screenshot of your EFT transfer to rockhamptonsunrise@gmail.com. The Rotary Club of Rockhampton Sunrise will arrange the transport and logistics in dispatching these kits ASAP. Please give generously, if you can. Finally, given the strong Nepalese community here at CQUniversity, most staff would know a colleague or student from Nepal. Please reach out to them and see if they are OK. I have heard a number of stories of students who have lost immediate family members, and many more unable to confirm the safety of other loved ones. I can only imagine how distressing it must be to be thousands of miles away from your home country watching the news reports of the devastation back home. Please know that you are not alone and that the whole CQUniversity community is thinking of you at this difficult time.